If you type out a server name for Mibbit , your personal information (like your IP address) can be revealed to everyone. 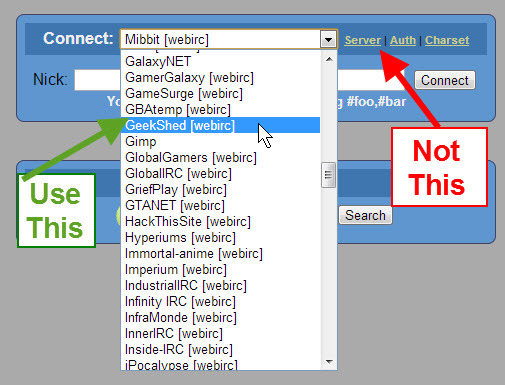 To protect your privacy, please be sure to choose GeekShed from the list of networks on the Mibbit site. Do not click the “Server” link to enter a server name. If you have any other questions about using Mibbit, check out the documentation on the Mibbit site. This entry was posted on November 15th, 2012 and is filed under Explanation. Note that if you connect in that way, your IP can be revealed to anyone on the network. Mibbit does not cloak your IP completely unless you use the pull-down list, as shown in the image. Likely if you used our name in the drop down option when you setup your widget you’re likely fine. To test this, do a /whois YourNick and if your real name shows an IP address you need to update it. Posted in Explanation, News | Comments Off on Are You Using Our Round Robins? Can I link a server to GeekShed? Posted in Explanation | Comments Off on Can I link a server to GeekShed?